1.Children learn that we can grow beets in a garden. 2.Children review how beets grow. • Make a beet using a paper plate and colored paper. Create the beet root on the paper plate, and paste green strips to the plate as the beet greens. Use this plate as an example to show the class. • Tell children: we can grow beets in a garden. Ask children if anyone has ever grown beets in a garden. • Ask children to remember how beets grow (the roots grow underground; the leaves grow above the ground). • Provide children with plates, colored paper, scissors, and glue. 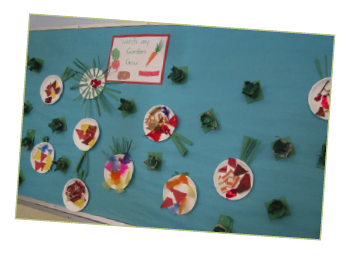 • Designate a space on a wall in the classroom for the “class garden.” Add to the wall each month with children’s colorful creations of the featured fruits and vegetables in the Harvest for Healthy Kids program.